We’re big fans of a hot breakfast around these parts, and while my husband could eat bacon, eggs, and hash browns about every day I like to change things up a bit. 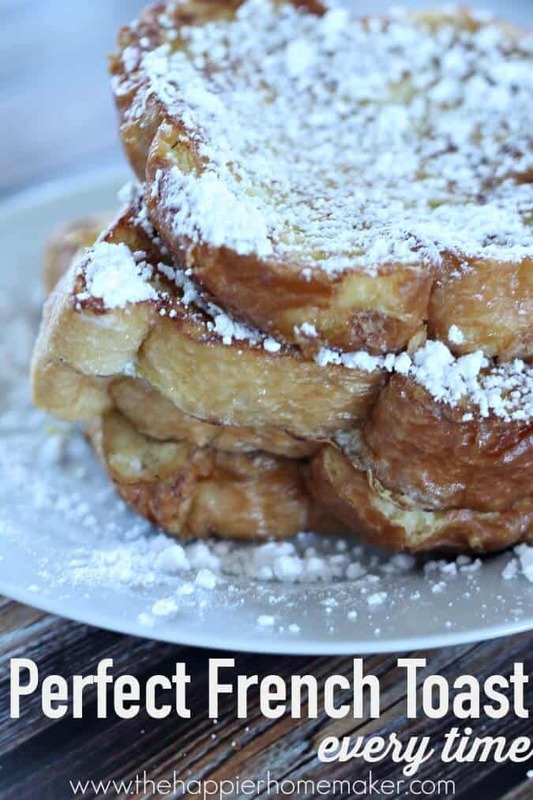 Waffles and pancakes make their appearances regularly but on extra special occasions I like to switch things up with this perfect french toast recipe-it comes out amazing every single time! 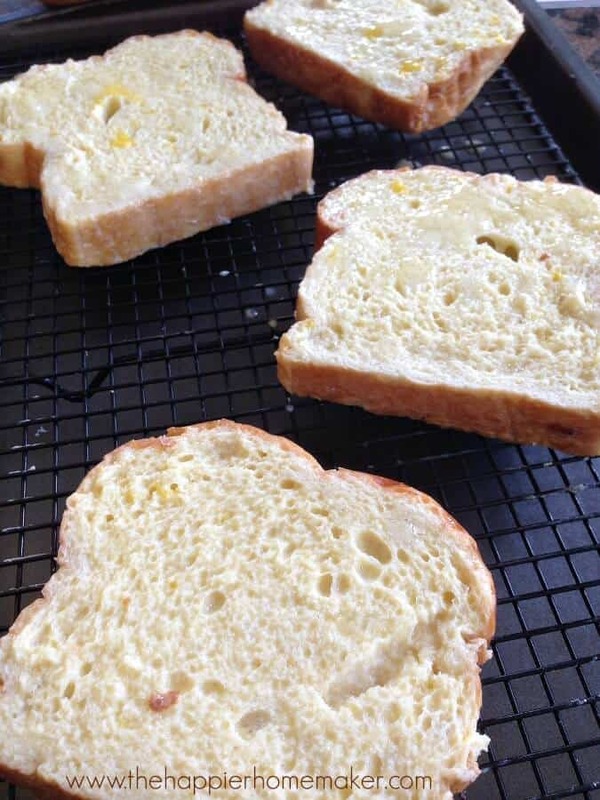 Slice bread into 1″ thick slices. In a mixing bowl combine eggs, milk, creamer, and salt. Microwave honey for 15 seconds to thin and add to egg mixture. Whisk well so the liquid is uniform-nobody likes scrambled eggs on their french toast! Soak each slice in the egg mixture for 30 seconds, flipping once. Set up a cooling rack over another pan and place toast on rack to drip for about 3 minutes. Spray a large pan with nonstick spray, then heat 1 tbsp butter over medium high heat. Cook each piece of toast for about 2-3 minutes per side until golden brown and place on a baking sheet. I generally work in batches of 2-3 pieces at a time. Place baking sheet with toast in oven for additional 5 minutes. Serve with powdered sugar and syrup if desired. 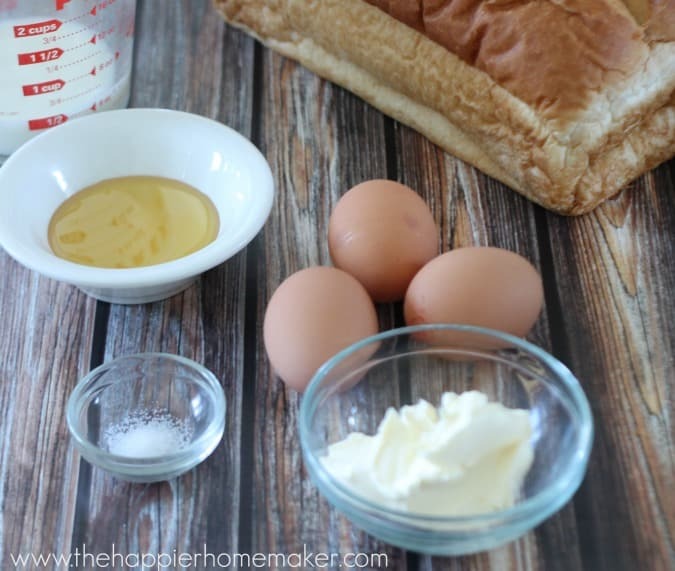 Get perfect French toast every time with this tried and true favorite French toast recipe! 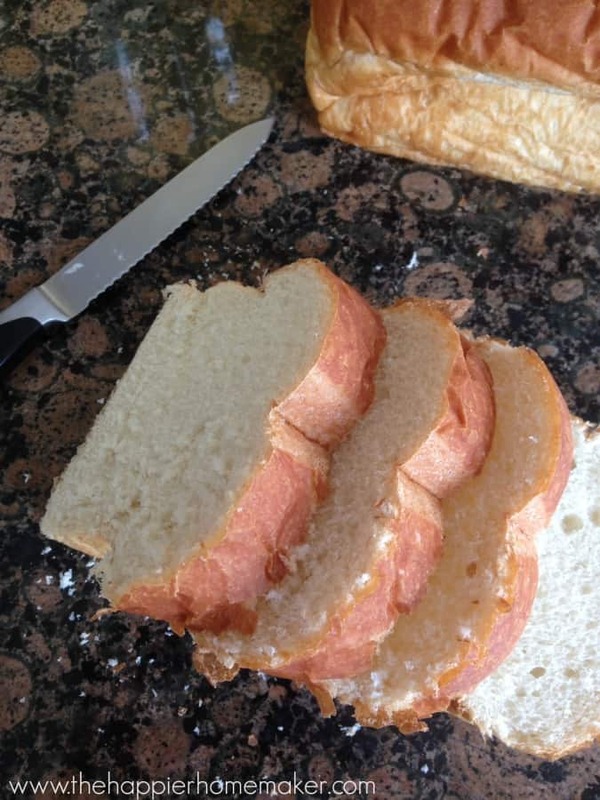 Slice bread into 1″ slices. Mix milk, creamer, eggs, honey and salt in a shallow bowl (or a 9×13 pan in my case). Soak bread slices for 30 second (flipping once) and transfer to a baking rack to drain for 2-3 minutes. Spray cooking spray in a large pan and heat butter over medium-low heat. Cook toast for 2-3 minutes on each side until golden. Transfer cooked slices to a baking sheet and bake for 5 minutes. Serve with powdered sugar and syrup. A few notes-if you don’t have vanilla coffee creamer you can substitute with another flavor of creamer, plain heavy cream, half & half or even milk, although the flavor will change slightly. Also, be sure to slice bread a full inch thick-if it is too thin you’ll get floppy, soggy toast! What is your favorite hot breakfast to make? 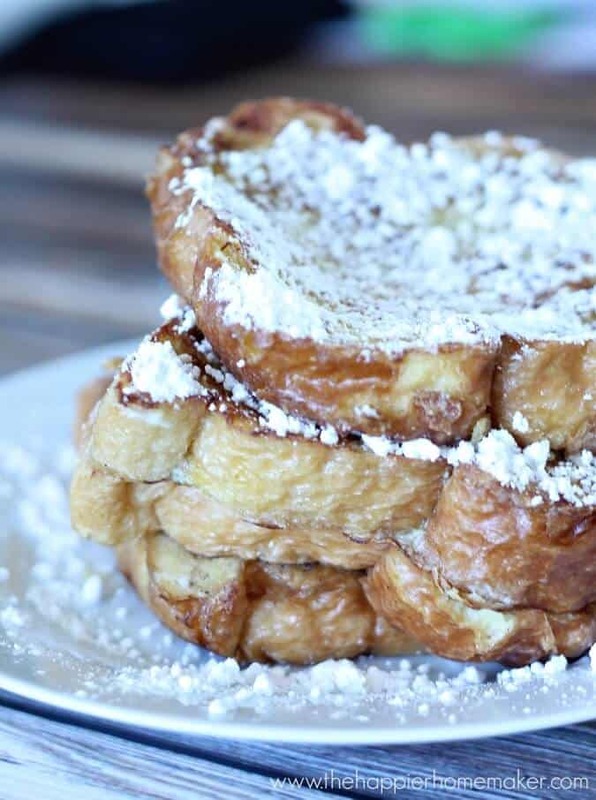 Are you a french toast fan? I love French toast!!! One of my favorite things to eat for breakfast! Me too Sharon! I hope you like this version! Irene taught me to sprinkle 2 T brown sugar in egg & milk mixture dunking both sides of toast before using a big spatula to put in.a skillet with plenty of butter. The wet side up bread gets cinnamon sprinkled on it. When browned bread is turn over bread, sprinkle cinnamon on cooked side of bread. Take browned bread out of pan and plate adding more cinnamon sprinkled on top sides. 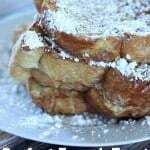 Top with powdered sugar and enjoy the best tasting French Toast you will ever eat! That sounds tasty Barbara-I’ll have to try that next time! Thanks for sharing!